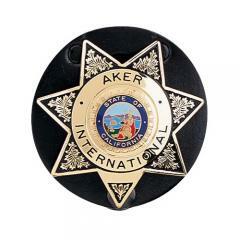 The 592 Clip-On Star Badge Holder from Aker is a convenient and compact option for carrying star-shaped law enforcement badges. It is made from premium cowhide leather in black or tan, giving it the durability and wear resistance required for duty use. On the reverse side, a low profile back clip makes it suitable for concealed inside-the-waistband carry as well as open wear, making it an ideal solution for covert operations. Its snap fastenings provide a secure grip on the belt, ensuring that your badge doesn't get lost, and it fits a belt up to 1.75 inches wide. Great clips, wish I could have gotten the exact size for my badge but these work.